ER: Extracts from reports in the BAAG Intelligence Summaries. 1943. “These docks, formerly run by OSK have now been handed over by the Army to Mitsui. The former name “Osaka Shipbuilding Co´s Kowloon Dock” has been changed to “Nippon Shipbuilding Co of the Navy, Kowloon Dock”. 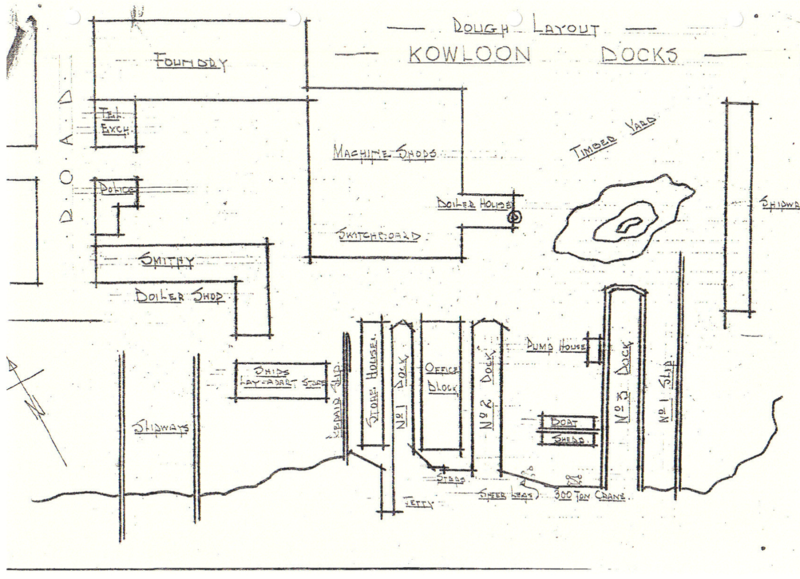 Under Kowloon Dock are Bailey Dock and Cosmopolitan Dock. The dockyard, which came under the control of the Kokoki 0r Koreki Butai in mid-1944, had been bombed on several occasions, but the greatest damage was reported to have been caused during the raid on 16 October 1944. All buildings except the Transformer Station and the Moulding shop were reported hit. The Ironsmith´s, Brassmith´s, and Coppersmith´s Shops, the Welding Shop, Boiler Repair Shop, Steel Plates Store and Machine Room were said to have been destroyed, while the Main Generating Station was either destroyed or badly damaged. The No 1 Slipway was extensively damaged and rendered unusable, while the cranes and internal railway system were wrecked. Half of the materials for building new ships was destroyed, as well as a large stock of petrol and coal. Many ships were sunk or damaged, casualties were heavy, and work was suspended for some time after the raid. 1943. “Working hours are 8 a.m. to 1 p.m. and 2 p.m. to 6 p.m. In cases where extra or night hours are employed, double pay is given. Extra hours means from 6 p.m. to 8 p.m. Night work is from 7 p.m. to 10 p.m. sometimes carrying on for the whole night. A holiday is granted every fortnight. Female labour is employed to work in the Electrical Department and the Saw Mill. Some are found in the casting room. In August 1944, the number of workers totalled 4678. One report said that as work was held up by shortage of coal, the workers were divided into shifts, each of 2000/2500 with one group being laid off alternately for a few days. 5. Among Ships seen in dock in 1942. Completion of four Empire Ships already started by British, Hsian Yiar Maru, Maya Maru, Tai Sun Maru, SS Ming Sang, SS Mau Lee, SS Monarch, 2 iron barges, Twin funnel tugboat, Kin Wa Maru, Kin Shan, 3 Russian ships, Victory Maru, American Maru, Kinka Maru, Gyo Yat Maru, Gyo Yi Maru, Kasii Maru, Hin Sang. Akatsuki/Gyoten, Date Maru, Nanshu/Nam Chow Maru, large wooden junk, Chung Hoi, Pui Hoi, No 617, Wing Ding Maru, Yin King Maru, Puk Hoi Maru, Wan Yung Maru, Sau Yat Maru, Sun Sai Maru, Wing To Maru, Ko Chi Maru, Wai Bi Sui Maru, Ming Sang Maru, Electric Star (former Star Ferry), Toyo Maru, Hakuyo Maru, Tien Lee/Tenri Maru, Kicho Maru, Ming Sang/Meisei Maru, Gyoten Maru, Tai Sun Maru, Kwong Cheung Maru, Wa Wa Maru, Ming Sang Maru, Tin/Tien Lee Maru, Hiu Tin/Choten Maru, Buenos Aires Maru, Lee Shing/Lee Sang Maru, Hiu Nam Maru, Shuntien Maru, Moller ship, 2 Russian ships, Ha Pau Naru, Fukinichi, Put Hoi, Pak Hoi, Tin Sang, Yat Tai Maru, Ryoyo Maru, Luzon Maru, Hong Kong Maru, Chu Kut/Sumiyoshi Maru, Shing Tin/Marita Maru, Khoon Shing/Kanjo Maru, Ke Kut/Kikichi Maru, Muk Yi Maru, Kwei Ching/Keijo Maru, Pak Yeung/Hakuyo Maru, Riyo, Asia Maru, Nam Chow Maru, Hui Hung Tsui/Hiu Nam Maru, Hung Shun Maru, Shun Yau Maru, Fook Kut Maru, Hei Cheung Maru, Nanshyu Maru, Yamada Maru, Maru, Kin Hing Maru, Ko Chi Maru, Hui Hung Maru. Among ships seen in dock in 1944. 4 F-type ships, 2 motor sailing vessels, 5 powered cross-river craft, Akatsuki, Gyoko Maru, 6 (Tai Fou Chau class), Military landing craft, Koto Maru, Shirogane/Shiragane Maru, Kaishu Maru, Kainan Maru, Minkaku Maru, “Special 44”, Nichishiki/Hifuku Maru, Hitsu Maru, Tenri Maru, Kinkaku Maru, Kinro, Ginkyo, Haruryo, Chiryo, Tin Sang Maru, Shimada Maru, Minkyo, Taifu/Otomi Maru. The photograph shown on the Home Page is one sent by IDJ of Hong Kong & Whampoa Dockyard and presumably taken shortly after the end of WW2. This article was first posted on 22nd February 2015. Hong Kong & Whampoa Dock Co Ltd – what happened to its famous Hammerhead Crane? Thank you a helpful lead.